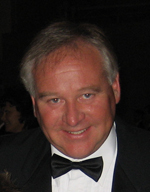 Peter is President and Chief Executive Officer of Lunenburg Foundry & Engineering Limited. He is a registered Professional Engineer and holds a degree in Mechanical Engineering and a Masters in Naval Architecture and Marine Engineering. Peter also serves on a number of community and professional boards and organizations. Peter has always shown interest in finding new ways to to do things at LIFE. His areas of research include Concentrated Solar energy systems, Investment casting and lost foam techniques, blockage and movement systems, and the development and implementation of computerized design systems. Peter has been involved with various marine vessel designs, including tall ships, fishing vessels, and pleasure craft. He has conducted R&D in; Hydrogen powered marine propulsion, micro-processor controlled fuel monitor, propeller design, engine marinization, CNC machining, trawl door design, development of aquaculture related equipment, as well as conducted ship-repair and modification projects. Peter graduated from Lunenburg High School in 1975 and was then accepted at Dalhousie University in the new four year Engineering Program. In 1977 he received his Engineering Diploma from Dalhousie and the began studies at the Technical University of Nova Scotia (TUNS). Upon graduating from TUNS with a Bachelor of Engineering in Mechanical Engineering in 1979 he completed a Masters degree in Naval Architecture and Marine Engineering, with specialty in hydrodynamics at the University of Michigan, in 1981. Peter was elected Commodore of the Quarterdeck Honorary Society and became the worlds first student representative to the Society of Naval Architects and Marine Engineers. Nova Scotia Boatbuilders Association Board Member, Chairman. Lead a delegation to New Zealand in 2004 to learn about their training methods in the boatbuilding industry. Subsequent efforts lead to the designation as “boatbuilder” as an apprenticieable trade in the Province of Nova Scotia and adoption of the New Zealand program. Canada/Nova Scotia Offshore Petroleum Development Board – member and acting Chair. Oversaw as a regulator, the most rapid period of growth of Nova Scotia’s offshore. Lead to the establishment of independent safety staff. CANMET, Department of Natural Resources, Canada Industry Boardmember. The LIFE Prometheus team inadvertently vaporized steel using the Gamma II prototype on the 10th of February 2010. The test, which had initially been intended to be the first steel pour using Prometheus solar technology, quickly became the first vaporization of steel when the steel sample was left in the light focus for a couple extra minutes. In the time between determining that the sample was ready to pour and preparing an appropriate sand bed for pouring, the steel completely vaporized. All that was left when the contents of the crucible were dumped out was some slag, the steel had vaporized into thin air.